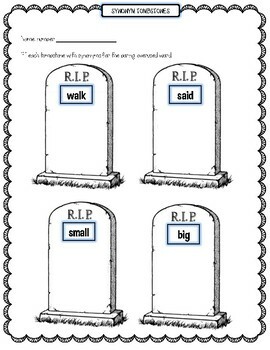 Here’s a fun way to play with words! 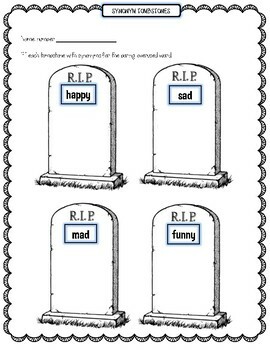 Students can fill each tombstone with new, more interesting words and put the boring, overused word out of their misery. This is a great activity for students to work independently or in pairs. They can also practice reference skills by using a thesaurus or an online resource for help with coming up with enough words. 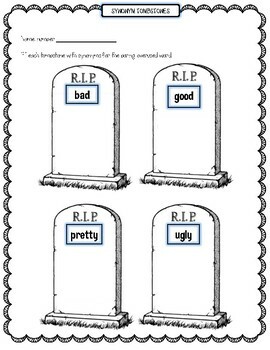 These can either be displayed on a bulletin board or cut out and kept in student notebooks for reference for future writing activities. 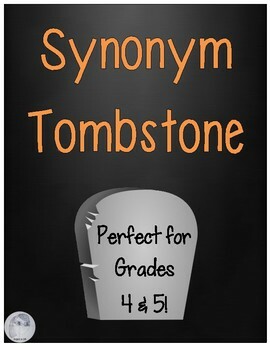 Included in this resource are sheets with 4 tombstones each, a blank sheet with 4 tombstones if you have other words not previously listed, and a sheet with a larger tombstone that could be used on a bulletin board.